Today's Image of Mars shows some of the thickest fine-grained layered deposits on The Red Planet. 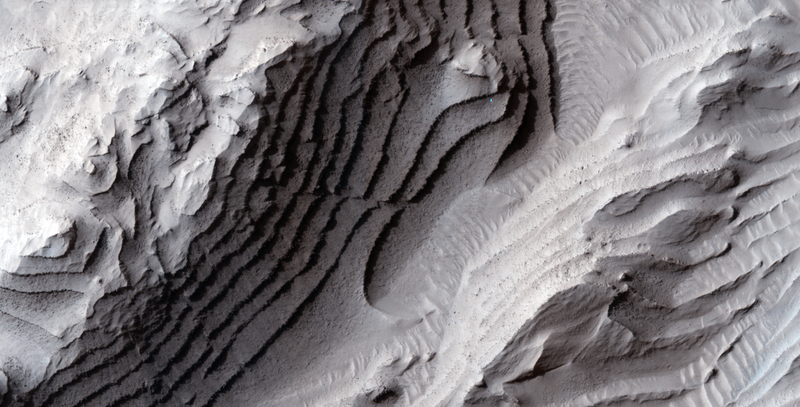 These layers are in West Candor Chasma, which is located in central Valles Marineris. Scientists have been able to determine that the layers are fine-grained because the wind picks up small particles and carries them through the air, which HiRISE is able to detect. But what deposited these layers? One explanation is that wind, volcanic ash, or water, or a combination thereof deposited the layers, which were then altered by ground water. When alter by the ground water the minerals became hydrated and formed clays and sulfates. Water was abundant in Hellas Basin during different periods, so it is possible that this multitude of water could be responsible for the extremely thick layers, since the more water there was, the larger the layers. Today's Image of Mars shows a relatively young crater measuring 50km in diameter. The crater has a significantly less superimposed craters than the surrounding terrain, which is how scientists determined it was a relatively recent addition to the landscape. Scientists speculate that many of the landslides we see in Valles Marineris may have occurred as a result of the impact that formed this crater, but we can never be sure. Today's Image of Mars shows terrain in Gale Crater slightly southwest of the Mars Science Laboratory Curiosity's August 2012 landing site. This image captures three different features: older plains, overlain with some sedimentary deposits and active sand dunes. Scientists speculate that the sedimentary deposits are hardened mud, which has fractured over time. Hardened mud is a prime target for Mars Science Laboratory because it can help scientists to determine the acidity of the water in which the mud formed. Water with low acidity is more conducive to life as we know it, so examining some could give us some idea as to the habitability of the area at various points in the Martian past. Study of the sand dunes has shown that they were formed by heavy winds blowing from the southwest toward the northeast. The sand dunes are still active, but moving very slowly across the surface. Today's Image of Mars shows a potential landing site for future missions to Mars in Ismenius Cavus. Ismenius Cavus is a 600m deep basin that was once a lake, located north of Arabia Terra. The basin has six distinct valleys that run into it, lending credence the idea that the basin once contained a large lake. Further evidence that water was abundant in Ismenius Cavus is found in the minerals. Iron and magnesium phyllosilicates, as well as clays have been discovered in the area, which are only ever formed in the presence of water. 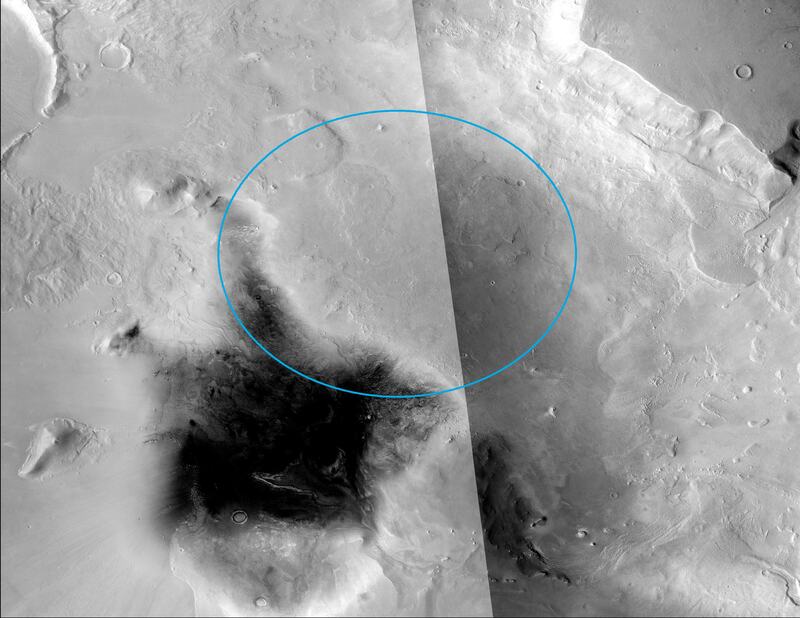 The outline below indicated the candidate landing site for the Mars Science Laboratory. It was beaten out by Gale Crater, but will most definitely remain at the top of the list of potential landing sites for future missions to Mars! Today's Image of Mars shows a potential landing site for future missions to Mars in Northeast Syrtis Major, near the northwestern rim of Isidis Planitia, a giant impact basin. The region exposes bedrock from the Early Noachian period, which was approximately 4 billion years ago. Some of the exposed bedrock contains hydrated minerals that were deposited during times when the Martian environment may have been more conducive to life as we know it. There is a wealth of knowledge to be gained from studying ancient bedrock up close with a rover, so we will likely find that Syrtis Major will be on the list potential landing sites for future manned or unmanned missions to Mars! A lot of people don't understand why increasing celebrity support of the space industry is so important. I've been hearing things like, "People have their own minds, no one is going to support something just because a celebrity does," or "no one cares what celebrities think." This article will address the misgivings I've heard about the Mars Stars initiative to increase celebrity support of the space industry. 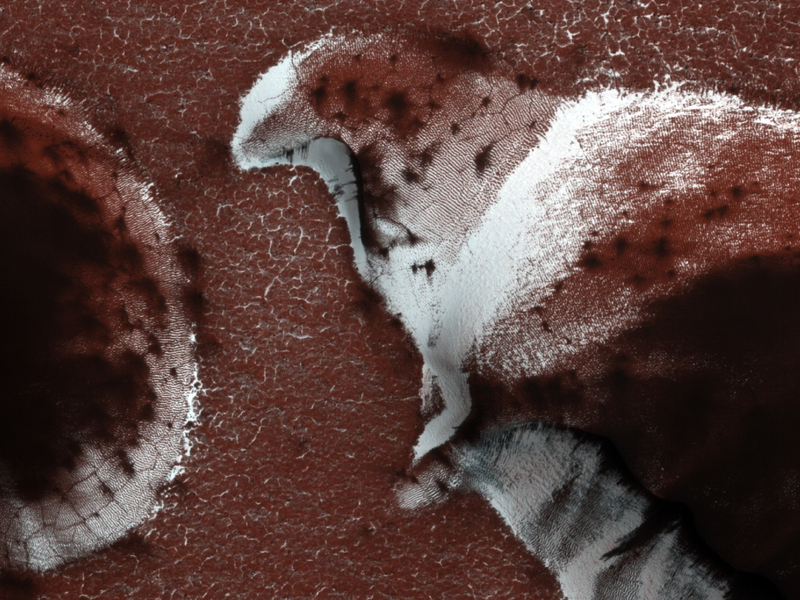 Today's Image of Mars comes from HiRISE shows defrosting dunes in the north polar region during late spring. The ice that you see is primarily carbon dioxide ice, which builds up over the winter months. During the spring the carbon dioxide ice begins to sublimate, turning directly from a solid into gas. By the time this image was taken most of the ice had sublimated. As summer approaches more and more of the ice will sublimate, leaving only small patches, if that, but then when winter comes around the ice will begin to accumulate again! Thus is the never ending cycle in the north polar regions of Mars. Today's Image of Mars shows landside lobes in a crater on Mars, as taken by HiRISE aboard the Mars Reconnaissance Orbiter. The southwest side of the crater has at three landslide lobes. Scientists have determined that the landslides occurred long after the formation of the crater because there are few overlying craters on the lobes than the rest of the surrounding surface. Scientists speculate that the landslides were created by tectonic activity either created by asteroid impacts or faulting in the crust. 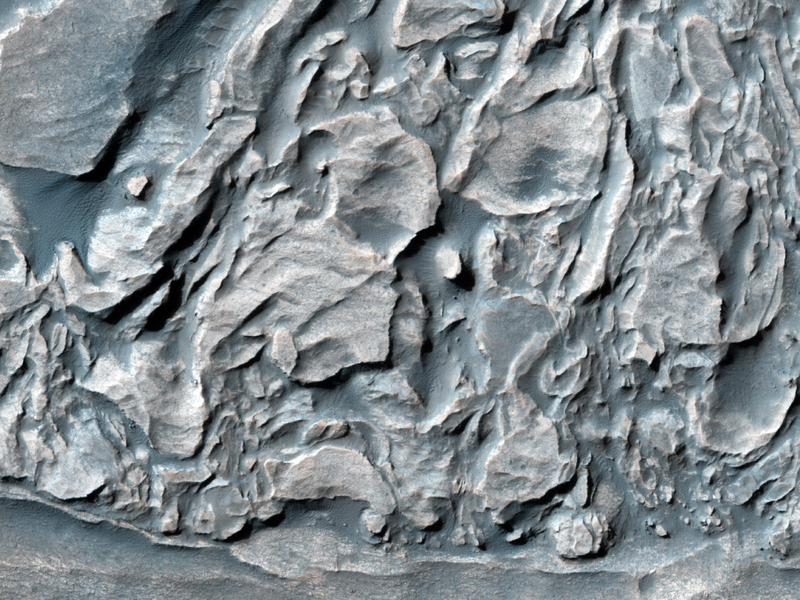 Clicking on this will take you to the original captioned image from HiRISE. Today's Image of Mars is a reminder that features on Mars are constantly changing due to wind erosion. 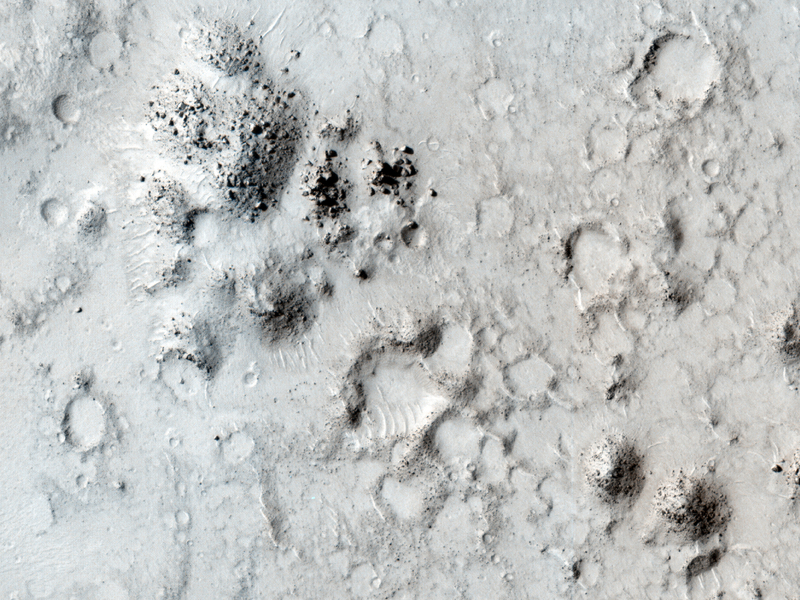 The image from May 2010 shows tracks left from large and small boulders as they rolled and bounced down the slope in Eastern Isidus Planitia. 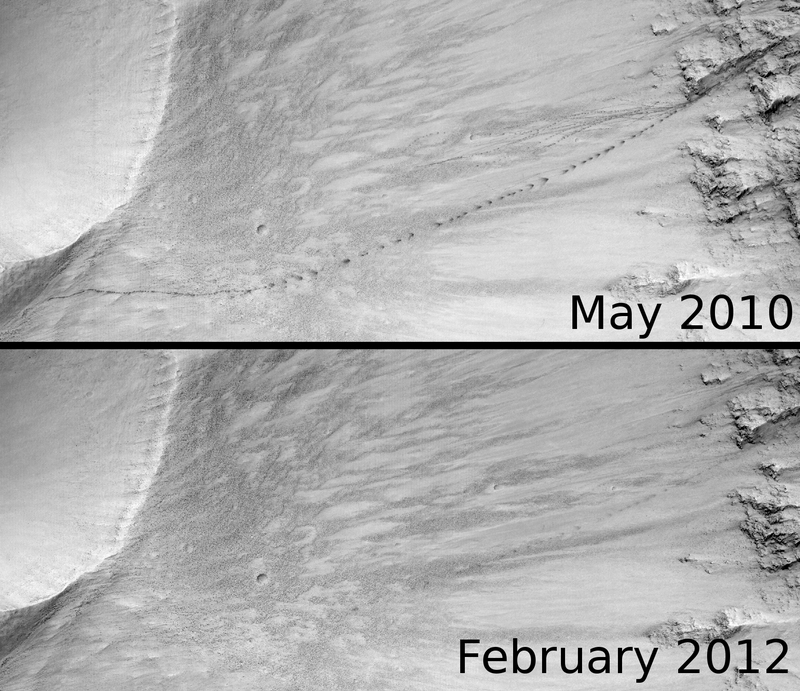 When you compare that with the image of the same area in February 2012 you'll notice that all but the largest trail has been completely erased from the surface, and even that has been significantly faded. It's important that we realize that not all features on Mars are permanent. This is in direct contrast to the Moon, where even today the footprints of the Apollo astronauts can be seen. Understanding that Mars is still a changing planet is essential when sending future missions to Mars because we need to make sure that we use more permanent features for navigation while on the Red Planet. This may seem obvious, but when you look down from orbit it's easy to forget that some features can change in just a matter of months, given the right circumstances. Today's Image of Mars was taken by HiRISE and shows Atlantic Chaos, a 161km stretch of jumbled and disrupted terrain on Mars. Atlantic Chaos was once considered a candidate landing site for Mars Science Laboratory, but it was beaten out by Gale Crater. Atlantic Chaos is located in Phaethontis quadrangle on Mars and measures roughly 161km across. Could this be a future landing site for missions to Mars? We'll have to find out, but since it was already a candidate it seems likely! 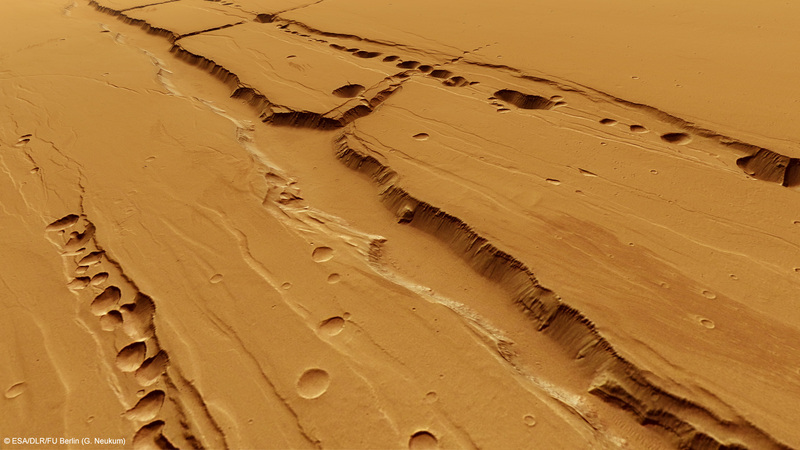 Clicking on this image will take you to all other images of potential landing sites showcased by Mars Travel. Today's Image of Mars comes from HiRISE and shows a potential future landing site in Utopia Planitia for future missions to Mars. This area is thought to have once held a giant lake, the water from which seems to have at least partially retreated underground. It was once among the top candidate destinations for the Mars Science Laboratory, but lost out to Mount Sharp in Gale Crater. Recent imaging with gamma-ray and neutron spectrometers on Mars Odyssey has revealed that an abundance of hydrogen molecules lie just one or two meters below the surface, which is indicative of water being right below the surface! You can bet that Utopia Panitia will remain on the list of potential landing sites for future missions to Mars! Clicking on this image will take you to other potential future landing sites showcased by Mars Travel, since the original HiRISE image isn't much larger and has no caption as of yet. Today's Image of Mars shows what was once a potential landing site in Libya Montes for the Mars Science Laboratory. Libya Montes are a ring of mountains on Mars that was created by the giant impact which created the Isidis Basin to the north. Think of Libya Montes as the rim to the crater that is Isidus Basin. The Isidis Basin is extremely ancient, so studying the uplift created from the impact will allow scientists to look extremely far back into the Martian past. There is evidence that Libya Montes has also been eroded by water in the past, so it is possible that it was once a habitable region! That's why Libya Montes has consistently been at the top of the list for candidate landing sites, and will likely remain that way until we send a mission to those ancient mountains. Clicking on this image will take you to other potential landing sites for future missions to Mars! Today's Image of Mars shows a closeup of the eastern wall of a pit in Amazonis Planitia, courtesy of HiRISE. The darker streaks you see are the result of dust avalanches that removed a thin layer of light dust that covers the rest of the surface. You can see in the upper part of this pit near the rim that there are four distinct layers, which is indicative of at least four separate lava flows that covered the area. The terrain directly surrounding the pit is much less defined, which may be the result of a heavy dust covering that has muted the features. Another sign that there is a havy dust covering surrounding the pit is the bluish haze just around the rim, which the HiRISE team believes could be suspended dust. This can happen if wind lifts some of the dust covering into the air. Today's Image of Mars was taken by HiRISE in order to examine the topography of an area in Cerberus Fossae that is thought to be the source of liquid that flooded the surface long ago. Scientists have long speculated that the water erupted from a ruptured underground reservoir and flooded the area, but recently some scientists have speculated that the channels and other features associated with a flood could have been created by lava, and not water at all. The reason for this newfound speculation is that over top of the features carved by the flood lies a layer of lava. This leads some people to wonder if there was any water involved at all, since a flood of lava could have created similar features. The problem for scientists comes with proving either theory because the lava layer that coats all the features hinders our orbital intruments from determining what lies beneath. If underneath the layer of lava are sedimentary layers that would imply that water was involved, which deposited and compacted the sediments. However, if there are no sedimentary deposits then the "no water" theory would be given some credence since most large quantities of flowing water leave sedimentary evidence behind. My vote goes for the terrain being carved by a flood of water, which retreated back under the surface or evaporated when the climate changed on Mars. The area then likely experienced volcanic activity and was covered by a large lava flow. But anything is possible, so its important to keep an open mind! Today's Image of Mars shows strangely uniform layered deposits in Danielson Crater, as taken by HiRISE. The uniform size of these layers is indicative of climate change on Mars that occurs in regular intervals. So what does that mean? It means that our solar system goes through recurring, regular changes that effect the climate of places within it. Yes, I know these layers only tell us that Mars goes through regular changes in climate, but there has to be a reason for that doesn't there? If we know that climate change occurs on a regular basis in our solar system we can begin predicting when the next change will occur so that we're more prepared for it. We can do this by analyzing features like the below layers on Mars to determine the intervals between each shift in climate. By studying what has occurred in the past we can better understand the present, while preparing for what the past tells us will happen in the future. Failure to prepare is preparation for failure. If we don't prepare for climate change - what history tells is a recurring trend and something we may not be able to fully prevent -then we are gambling with the life of our species. The first step to understanding climate change is by analyzing layers like the ones below to determine how often change occurs, how drastic the change is, and how abruptly it comes about. Understanding the process will bring us one step closer to controlling it and ensuring that we don't get caught unawares by something that we should have predicted. Today's Image of Mars shows layered deposits on the rim of a crater close to Argyre Basin, as imaged by HiRISE. 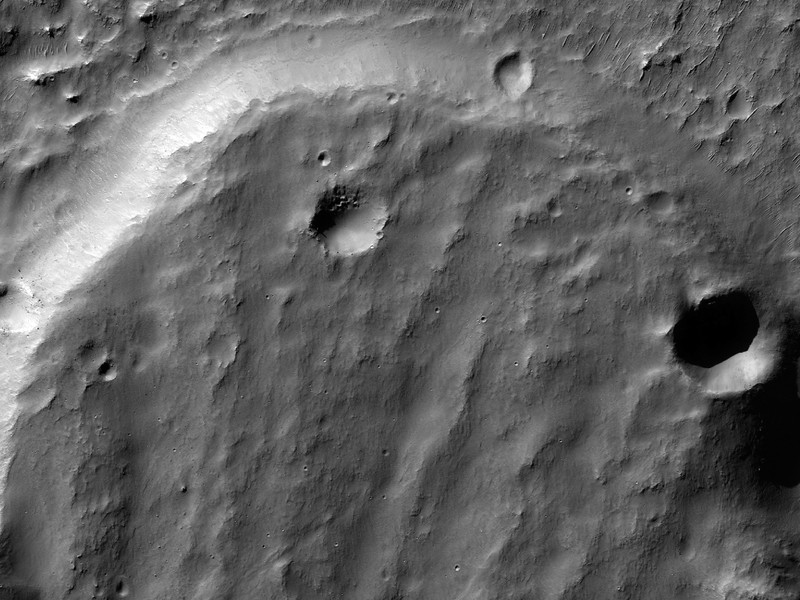 The sun struck the crater at a low enough angle that it cast the interior into deep shadow, while illuminating the distinct layers on the crater rim. Layered deposits are important to scientists because they provide insight about the past environment on Mars. Transitioning layers imply that the environment on Mars was changing during that time period; how much and how often depends on the variance and size of the layers. Today's Image of Mars comes from HIRISE and shows distinct sedimentary layers on the floor of Ritchey Crater. 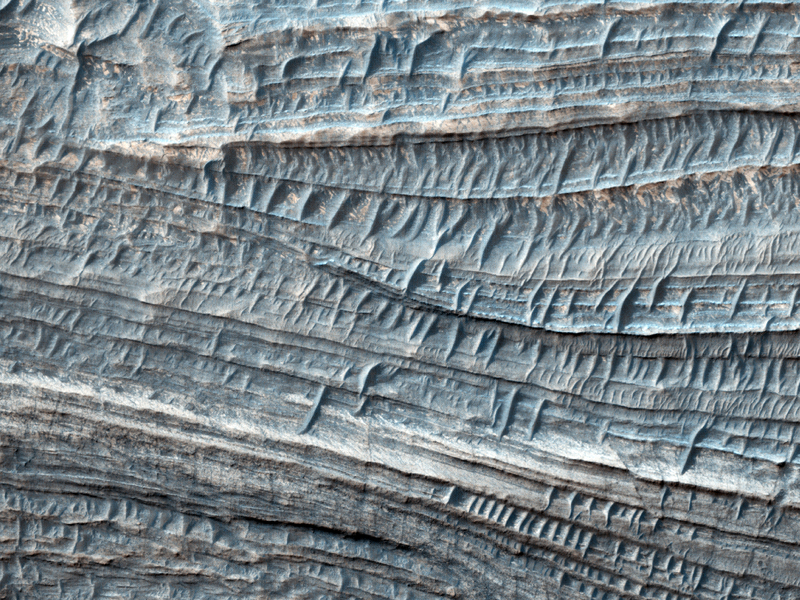 These layered deposits help to provide insight about the past climate on Mars and the periods of change The Red Planet went through. The blues and greens in the image are indicative of dry periods where the minerals were not altered by the presence of water. Examples of minerals that would fall into this category are olivine and pyroxene. The warmer colors, like the oranges and yellows, are minerals like sulfates and clays that were formed in the presence of water. Today's Image of Mars comes from HiRISE and shows the Northwest part of the ellipse where Mars Science Laboratory Curiosity has a 99% chance of landing. This ellipse was showcased in a previous Mars Photo of the Day. The imaged area is located at the base of Gale Crater's central mound, Mount Sharp, which the Mars Reconnaissance Orbiter, Mars Express, and Mars Odyssey Orbiter have determined is rich in clays and sulfates, both of which can only be formed in the presence of water. The plan is to have Mars Science Laboratory examine these clays and sulfates to help scientists get a better picture of what the environment on Mars used to be like. Doing this will help to determine whether Mars was once hospitable to life and whether it may still be. 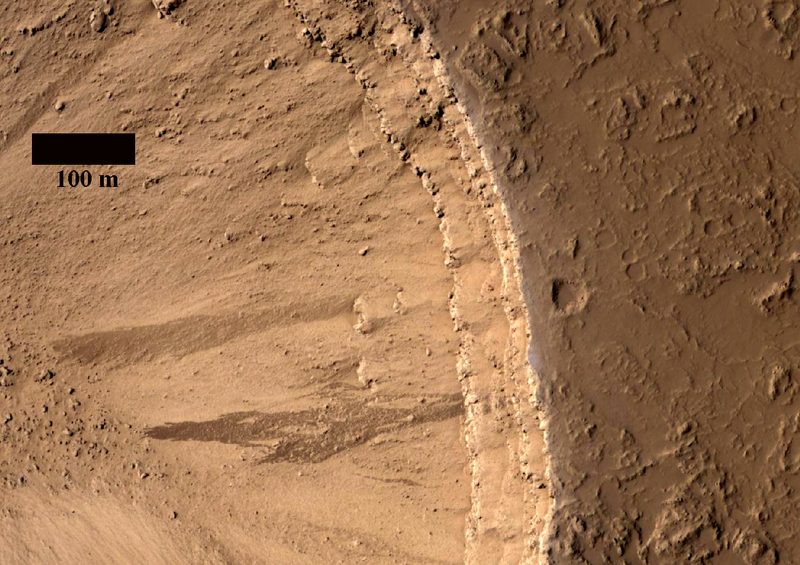 Clicking on this image will take you to all other images of Gale Crater showcased by Mars Travel. Today's Image of Mars comes from Mars Express and shows some pit-chains near the bottom of one of the largest volcanoes in the solar system, Alba Mons. These pits are indicative of lava tubes below the surface, that form in volcanic regions where lava flows solidify near the surface, but continue flowing underneath. When the lava ceases flowing the caverns are left empty and sometimes the roof of the caverns will collapse, leaving the pits you see below. Lava pits like these are prime targets in the search for life on Mars. One of the reasons scientists believe they have not yet detected any life on the surface is that the radiation levels are 250 times that experienced on the surface of Earth. This would be enough to kill most forms of life as we know it. What makes the lava tubes such a great target is that they are underground and shielded from much of the radiation that hits the surface. They have also been heated by the volcanic activity in the region and have likely experienced period when they were immersed in water, two key factors for life as we know it. Today's Image of Mars shows what we call a pareidolia, where you see something that isn't really there. This happens because the mind tries to associate everything it sees with something familiar so that it can understand it better. In this case many people looking at this will see an elephant (or if you didn't you probably do now). Click on this image to see the original image from HiRISE. 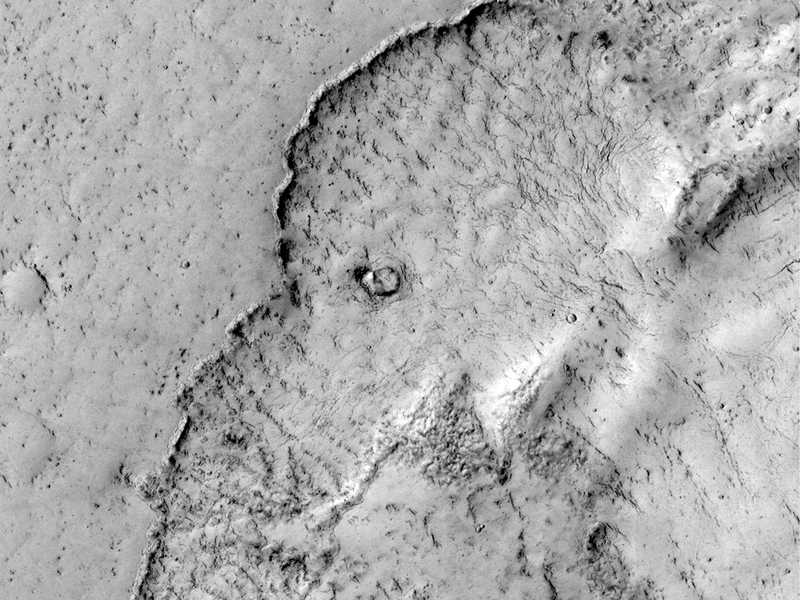 One the most famous pareidolia on Mars is the Face on Mars. 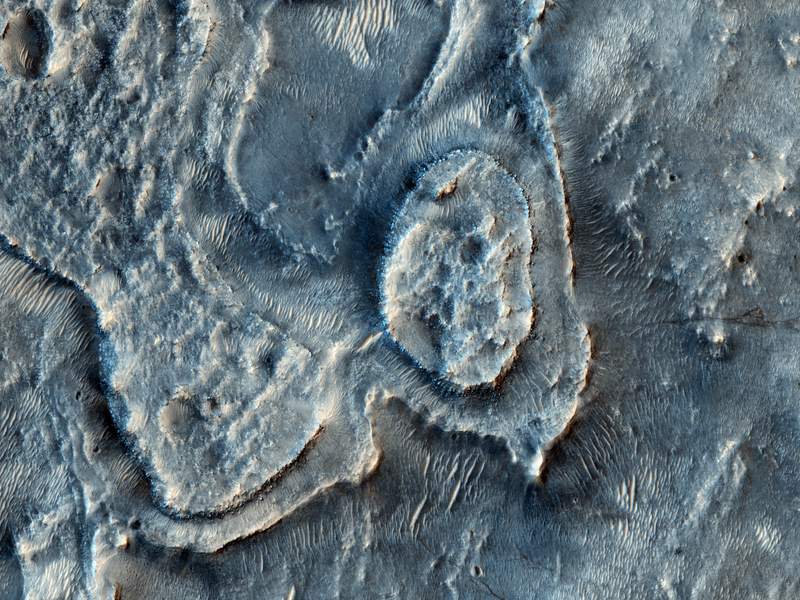 This image is actually a lava flow in Elysium Planitia, the youngest lava-flood province on Mars. Elysium Planitia is almost entirely covered by lava flows, which made the the region almost entirely flat. The lava flows are so young that the surface has not been checkered with numerous impact craters like most of the Martian surface. The lava flows erased all evidence of prior impacts by filling in the craters. 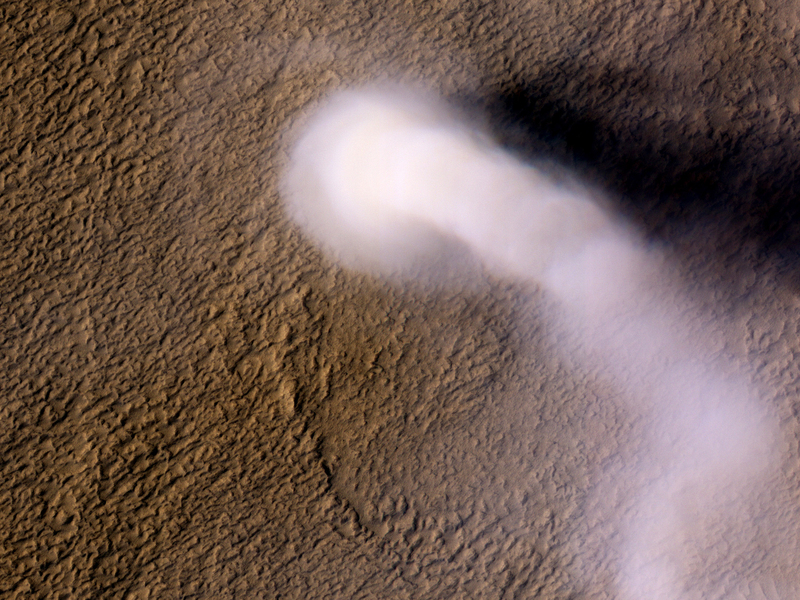 Today's Image shows an enormous dust devil in Amazonis Planitia on Mars, as taken by HiRISE. The dust devil reached as high at 20km above the surface, roughly the same size as a large terrestrial tornado. Even though the dust devil reaches so high it only measures 70m in diameter, which allows it to be twisted by high elevation winds giving it a snake-like appearance, like a similar dust devil showcased by Mars Travel. Dust devils on Mars are similar to tornadoes on Earth, but the biggest difference is that instead of water particles making up the visible outer layer, like in a tornado, dust and sand make up the visible layer. The dust devils on Mars are so much bigger than their counterparts on Earth because the Martian atmosphere is only about 1% as dense as that on Earth. 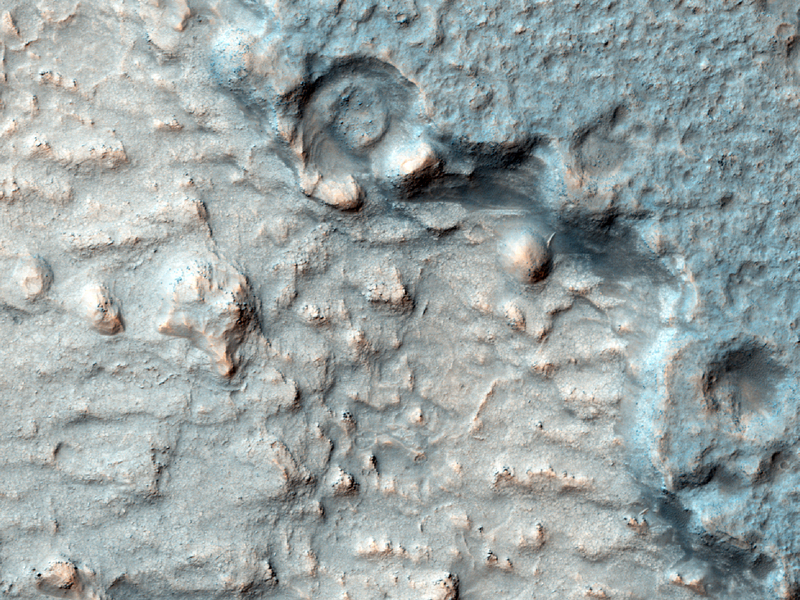 Clicking on this image will take you to the original, captioned image from HiRISE. I definitely recommend checking it out since they have attached animations showing what it looks like in motion from different angles. Today's Image of Mars shows a potential landing site in Holden Crater for the 2018 joint ExoMars rover, as taken by HiRISE. Holden Crater is 140km in diameter and numerous clays and sediments that could only have formed in the presence of water. Holden Crater was one of the top four candidate landing sites for the Mars Science Laboratory, which is landing in August 2012. The crater holds some of the best exposed lake deposits yet discovered on Mars, which makes it a prime landing site for any and all future missions to Mars that hope to determine whether Mars once did, or still does support life. NASA recently backed out of the ExoMars mission due to budgetary cuts, which forced the Russian Space Agency (Roscosmos) to take a much larger role in the mission. The joint ESA-Roscosmos mission appears to be going ahead on schedule with an orbiter expected to launch in 2016 and the rover expected to launch in 2018, but at this point anything could happen. It remains to be determined where on Mars the ExoMars rover will be sent, but we can be sure that Holden Crater is among the top candidates! Clicking on this image will take you to all Mars Travel posts related to Holden Crater because the original HiRISE image is not yet captioned. Today's Image of Mars comes from the High Resolution Stereo Camera (HRSC) aboard the Mars Express Orbiter and shows the Eumenides Dorsum mountains, which cover an area of 12,000 square kilometers. 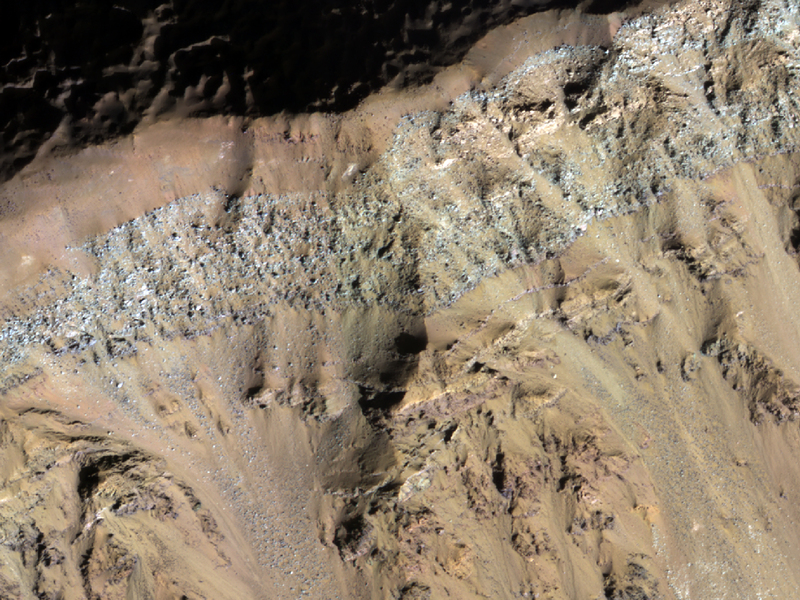 The mountains are to the west of the Tharsis Quadrangle and form part of the Medusa Fossae region, which scientists believe is covered by a blanket of volcanic ash. The region is full of features carved into layers of sedimentary rock by wind erosion. 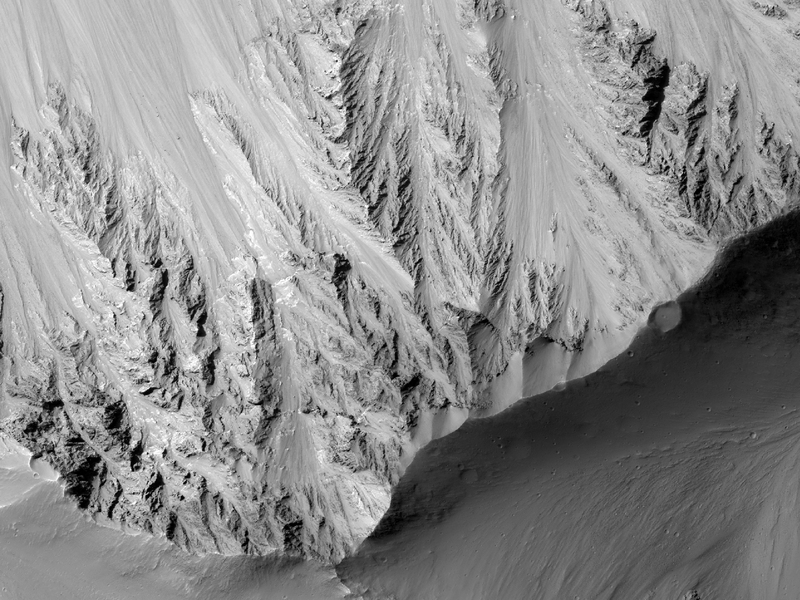 The smooth area in the center of this image is a result of that terrain being more resistant to erosion than the surrounding area. This indicates that the surface of that area is made up of volcanic rock, as opposed to more easily eroded sedimentary rock. Today's Image of Mars shows the landing site for Mars Science Laboratory Curiosity at the foot of Mount Sharp, the 5km high central mound in Gale Crater. 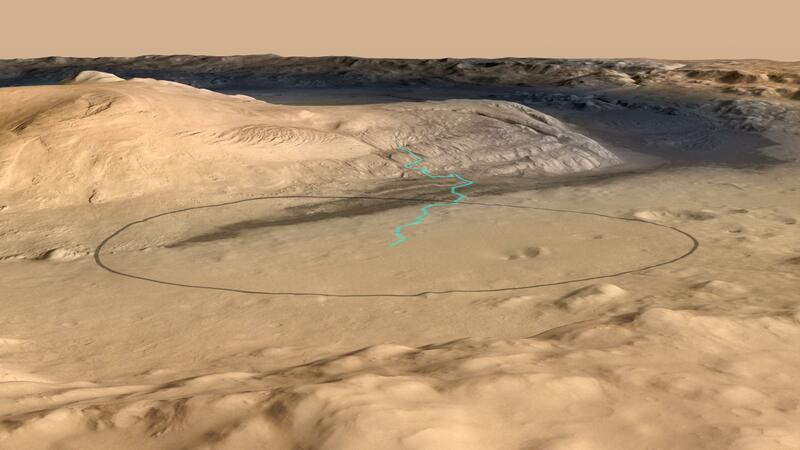 The turquoise line shows the expected path of MSL after it lands and begins navigating its way up Mount Sharp. The black oval measures about 20km by 25km and is the area in which MSL Curiosity has a 99% probability of landing. The lowest portion of Mount Sharp is comprised of clays and sulfates, materials which are formed in the presence of water. 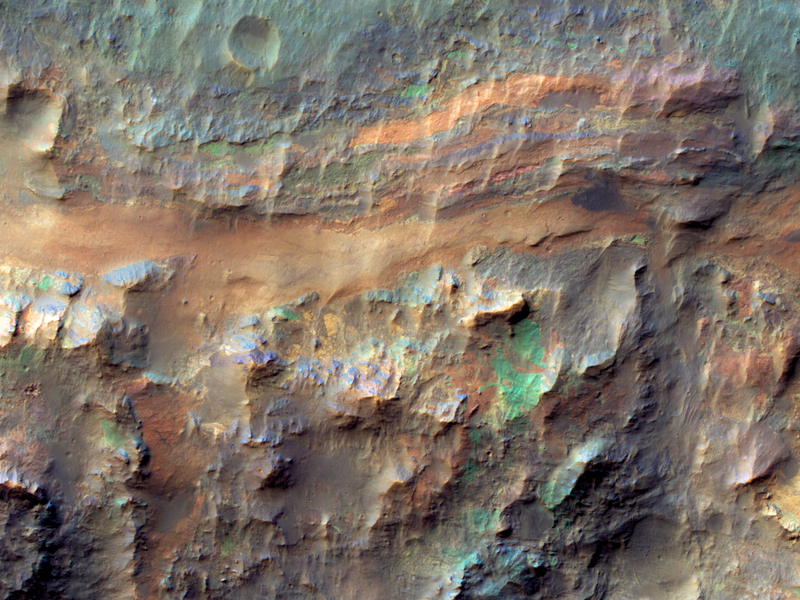 The overlying layers contain sulfates, but very little clay, indicative of an environment in which water was evaporating and Mars was becoming drier. Scientists hope that studying Mount Sharp's layers can provide insights into the past Martian climate and give them a better idea as to whether Mars was once, or may still be habitable.